Municipal offices will close at 2 p.m. today, and will remain closed through Monday, Jan. 2, in celebration of the New Year. Please note: This year's holiday will NOT affect trash or recycling collection. All Monday routes will be collected as scheduled. Our offices will reopen for normal business hours on Tuesday, Jan. 3. As you celebrate the start of a new year during this long weekend, please remember to celebrate safely and responsibly. On behalf of Township Council and our staff in Town Hall, we wish all of you a very happy, healthy and peaceful new year! Cherry Hill Police are cracking down on impaired driving through the holiday weekend. 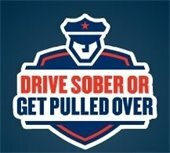 The Cherry Hill Police Department is once again participating in the national “Drive Sober Or Get Pulled Over" campaign, with targeted enforcement of impaired driving through Jan. 1. The campaign aims to cut down on incidents of drinking and driving during this holiday season. According to State Police statistics, 111 of last year’s 562 traffic crash fatalities were found to be alcohol-related. Even one fatality is too many. The message is simple: If you drink, don’t drive. If you drive, don’t drink. The results are costly, from losing your driver's license, to being involved in crash that was easily preventable. For more information on DWI prevention and awareness, visit the NHTSA site at www.nhtsa.gov, Mothers Against Drunk Driving at www.madd.org/local-offices/nj, or the NJ Department of Law and Public Safety’s informational page at www.nj.gov/oag/hts/alcohol.html. The Cherry Hill Police Traffic Safety Unit may also be reached for information regarding this and other traffic safety campaigns at (856) 488-7820. Rock Climbing Instruction: Become a pro rock climber! These rock climbing classes are filled with adventures and games that are designed for children ages 6 through 17. Children will develop climbing technique, mental focus, teamwork, as well as social and problem solving skills. Ballet Classes: Pennsylvania Ballet is pleased to offer Intro and Basic Ballet classes at Croft Farm Arts Center. Intro to Ballet is designed to encourage creative movement, self-expression, and group interaction while introducing basic ballet vocabulary and music concepts. Basic Ballet is slightly more structured and designed for older children, ages 6-7. Basic Ballet participants will learn to jump, turn and develop strength. Laughter Yoga: Laughter Wellness is a whole body, well-being workout that integrates Laughter Yoga exercises and the power of breath, movement, sound and engaging activities to promote a healthy, joyful and vibrant life. There are no yoga poses and you don’t need to be flexible or funny. The yoga aspect encompasses breathing exercises and mindfulness. It’s uplifting, energizing and fun! It’s wonderful for building community connection, stress relief and helping to ease anxiety and mild depression. The Cherry Hill Fire Department has been designated as an ISO Class 1 Fire Department, a rating insurance companies may use when they establish premiums. The designation became effective Dec. 1, 2016, and the CHFD has provided a letter for residents to notify their insurance companies of the change. You can click here to download and view a copy of this letter, and print it to provide to your insurance company. For more information, or to ask questions about this designation and what it means for you, contact the Office of the Fire Chief at (856) 795-9805. 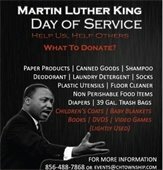 This year's Martin Luther King Day donation drive is now underway. The season of giving doesn't end with the holidays! There are residents in need within our community all year long. As part of our Martin Luther King Day of Service observance, please consider supporting our annual donation drive, which will several worthwhile, local organizations: Woodford Cedar Run Wildlife Refuge, the Cherry Hill Food Pantry, Cathedral Kitchen and Little Hands, Little Feet. This year's requested items include paper products, canned goods, shampoo, deodorant, laundry detergent, socks, plastic utensils, floor cleaner, nonperishable food items, diapers, 39-gallon trash bags, children's coats, baby blankets, books, DVDs, and video games (lightly used). Attention seniors! 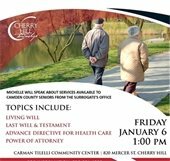 You're invited to a special session focused on a variety of senior-related topics with Camden County Surrogate Michelle Gentek-Mayer, at 1 p.m. Friday, Jan. 6, in the Township's Carman Tilelli Community Center, 820 Mercer St. This free event will highlight the many services available to area seniors from the Surrogate's Office, including living wills, last will & testament, advance directives for health care, and power of attorney. This event is free; no registration required. For more information, call (856) 661-4800, or e-mail Recreation@chtownship.com. Cherry Hill offers residents over 55 years of age an opportunity to join the Township's Gold Card program. The Gold Card entitles members to discounts from participating local businesses, as well as many Township-sponsored classes and events, and productions at Cherry Hill High Schools East and West. To join the Gold Card program, visit the Cherry Hill Recreation Department in Room 102 of the Municipal Building during normal business hours with proof of age and residency. Click here to view the most updated Gold Card directory. If you have questions, would like to suggest an addition to the Gold Card program, or need assistance with any other senior-related topic, program, or service, please contact Gaye Pino, senior services program coordinator, at gpino@chtownship.com or (856) 661-4800.